Guide to the Universe - a journey to the stars! Guide to the Universe - a journey to the stars and beyond! This quote, in slightly different form, was first uttered by British scientist J. B. S. Haldane in 1927. It's even more applicable today. Over the years, there have been more and more discoveries about our Universe, with such things as the Hubble Space Telescope taking astronomy to a new level. Credit: NASA, ESA, R. Windhorst, H. Yan This image, of the "deep field" view of the cosmos, taken by the Hubble Space Telescope, shows that even an apparently empty bit of space is not what it seems. In the unbelievably far distance, the universe is still teeming with galaxies. 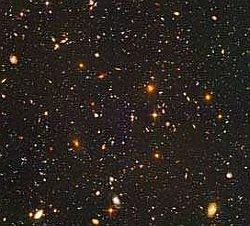 This image, of the "deep field" view of the cosmos, taken by the Hubble Space Telescope, shows that even an apparently empty bit of space is not what it seems. This website attempts to detail all the currently known, weird and wonderful things to be found out there - from the unbelievably small, to the mind-bogglingly big. And yes, the Universe is big! In fact, "big" doesn't even begin to describe it. To put things into perspective, just try looking up at the sky on a clear night. It will, of course, be full of stars. The number of these celestial bodies you can see will comprise only about 0.000003% of the Milky Way, our home galaxy. When you consider that this is only one galaxy out of billions and billions, you'll get the idea. There really are more stars in the universe than there are grains of sand on the whole of planet Earth. 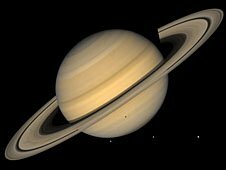 This image of Saturn, courtesy of NASA, shows how the various probes sent out into our solar system, over the last few decades, have been sending back ever clearer photographs of our nearest celestial neighbours. This site is aimed at anyone who has more than a passing interest in outer space, but doesn't necessarily want to be bombarded with complicated scientific jargon. We start in our own backyard, with the Solar System (which itself contains a few strange objects), then move gradually further and further away, until we reach the boundary of the observable Universe. Notice how I'm giving Universe a capital "U"? That's to distinguish it from any other universes! Yes, there are theories around that ours may be only one of billions of other universes. Now, if that's not a strange notion, I don't know what is. This site explores that possibilty and attempts to explain it in easy to comprehend language. So, whether you are only vaguely curious about the wonders of the Universe, or are an avid fan of the subject, I hope this website kindles even more interest and is a fascinating, enjoyable read - as well as an informative one. Ready for blast-off? Let's go!